The Cuisinart DCC-1100BK/JK-17/CPB-300/TOB-40N/WM-SW2N is a combination of Coffeemaker, Electric Kettle, Blender System, Toaster Oven and Sandwich Grill.The Cuisinart DCC-1100 is a 12-cup coffeemaker which has a classic design with stainless-steel accents, brews up to 12 cups of coffee at a time and offers 24-hour programmability. The unit provides a 1- to 4-cup setting for brewing a smaller amount without compromising flavor. The CPB-300 is a compact Portable Blending/Chopping System. This compact system delivers big performance with a 350-watt motor and user-friendly electronic touchpad. It comes with patented ultra sharp stainless steel blades. 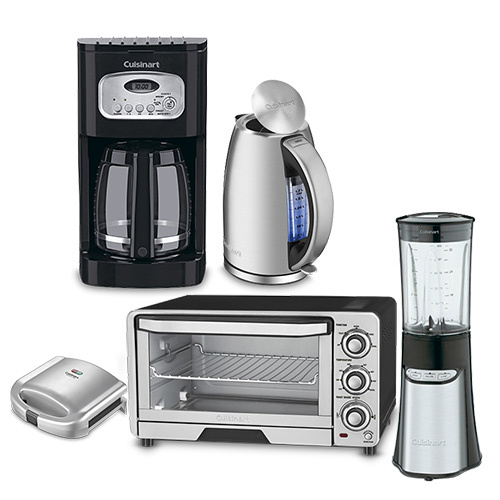 The Cuisinart Coffeemaker, Electric Kettle, Blender System, Toaster Oven and Sandwich Grill Kit has many exciting features for users of all types. See the Cuisinart Coffeemaker, Electric Kettle, Blender System, Toaster Oven and Sandwich Grill Kit gallery images above for more product views. 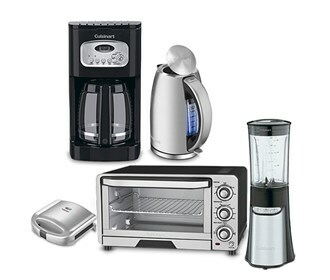 The Cuisinart Coffeemaker, Electric Kettle, Blender System, Toaster Oven and Sandwich Grill Kit is sold as a Brand New Unopened Item.